Or send us a message and we'll call you. Making Your Concept a Reality Since 1981Leading Manufacturer of ATM Kiosks, ATM Enhancements, and Signs. Even with all the bells and whistles, your ATM will benefit from the added marketing capabilities and customer conveniences of a Concept Unlimited ATM enhancement. All of Concept Unlimited’s custom ATM enhancements are built to amplify your brand, maximize storage space and enhance your customers’ banking experience. At Concept Unlimited, we believe that signs should do more than just convey information. Signs should serve a bottom-line business purpose. 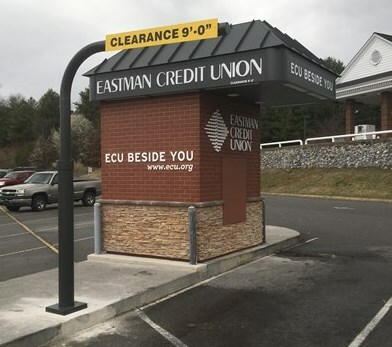 In addition to enticing customers, the right sign should highlight selling points, reinforce your brand, provide intuitive navigation and light the way toward increased profitability and prominence. 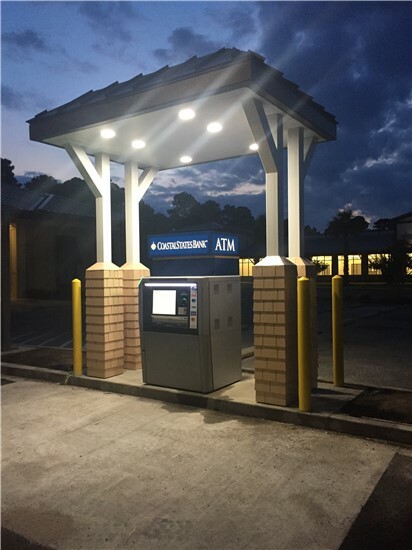 Concept Unlimited would like to feature the custom freestanding canopy installed for Coastal States Bank in Bluffton, SC. Custom features included a metal seamed roof and shake style siding on the pole covers to match the existing building. An illuminated topper was also installed on the machine for branding. Concept Unlimited is the leader in the sign and ATM enhancements industries due to our unmatched craftsmanship. We welcome you to visit our facility and meet our Concept team. For a quick insight into our company, please view the attached video where Concept Unlimited was featured on the Fox Business Network’s Manufacturing Marvels.